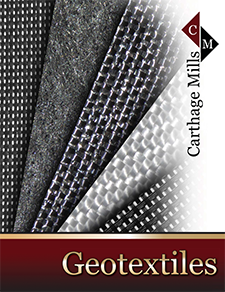 Carthage Mills' FX® Series of woven slit film geotextiles offers immediate and cost effective solutions for most separation and many stabilization applications. By providing and maintaining separation of the aggregate and subgrade soils, the system life of both paved and unpaved roadways is extended significantly. In unpaved applications, the aggregate remains useful throughout the entire life of the job, and access to work sites remains trouble free through all types of weather. Stabilization is provided primarily by their high strength at low elongation that distributes loads and reduces or eliminates rutting. Most all types of geotextiles are excellent separators of aggregate and subgrade. However, only 'woven' geotextiles have the high modulus - resistance to stretch - necessary to provide stabilization over soft or poorly drained soils. FX®–55 is a medium weight geotextile and the one most frequently used in DOT and private engineered projects. FX®–66 is a heavier weight geotextile typically used when higher than average stabilization is required. Carthage Mills' FX® Slit-Film Series of woven polypropylene geotextiles are designed to provide cost-saving solutions in a wide range of applications and varying site conditions. SEPARATION: Prevents dissimilar materials from intermixing, thereby extending the system lives of both paved and unpaved applications. STABILIZATION: Higher tensile modulus at low strains delivers immediate support and load distribution in moderate subgrade conditions. DURABILITY: Excellent resistance to installation damage assures long-term performance. COST SAVINGS AND EFFECTIVENESS: Low-cost and High performance assures savings in structural materials, labor costs and future maintenance for many civil engineering applications.